Illinois corn fields (pictured ​left); a Nebraska ice storm; the cherry farms of Michigan; a full moon rising over the desert of Nevada; massive wide-open spaces of New Mexico; fog-covered winding roads of the Smoky Mountains; and many more states, landscapes, and experiences—all define the author’s road trips that have sharpened her sense of home and homecoming. Between origin and destination, a road trip can offer priceless gifts, says the author. Join her on her drive through America, across vast landscapes and into the intimate warmth of homes at journey’s end. I came to the United States 22 years ago, as a student at a large public university. My family’s whispered sighs conveyed: this was an expensive adventure. Their hugs reinforced the loss we would all experience in time—of home. During the first two semesters, I also went on many field trips with peers. I admired the tall grass prairies and corn silos, some from a distance. I was learning to interpret the American countryside from pieces of paper and commentary. We traveled eastward to study historic monuments dotting a layered, very clearly two-tone American urban landscape from behind the safety of a windshield. Somehow, seeing that kind of Americana, through those filtered lenses and distilled eyes of my professors, through what my film camera captured seemed enough then. It was a very ‘comfortable’ way to see the country. Within it, I was to learn, see, and perhaps even nurture a desire to become part of it all. As an international student, I was not familiar with traditional American road trips like driving through small towns in RVs, the endless fields in rural farm country of the Midwest, its ageing gas stations and junkyards, the huddles of multicolored shopping complexes around communities, or mom-and-pop eateries along the way—except whatever the movies had portrayed—a portioned, edited version of reality. In India, I would have cared less about any of it. Not because an Indian landscape did not exist, but because the Indian culture bathes every nook and cranny of the Indian landscape, and everything that exists in its soil, so much so that it becomes intertwined and tangled with the soul of its people. Until modern technology was available, there were very few usable maps. One’s paths were based on one’s memory or were guided by the hand gestured directions of another, whose waving palms and descriptive references nearly painted the picture of our destination long before we got there. The curve of a road, the shade of an awning, or a thread wrapped banyan tree became the sentinels of the journey. A rural road bent one way to protect a sacred tree or even a rock. The journey was engaging. There is more to see on the back of a truck than just its license plate. The extent of rainfall and the depth of a homeowners pocket determined a roofline. A place of worship made itself known over airwaves as the calls to prayer or the rhythmic sounds of loud resonating bells danced in the breeze to caress one’s soul. The Indian landscape is all its own kind, uniquely ‘Indian.’ I saw it all because I felt it, lived it, breathed it. I did not need a book. 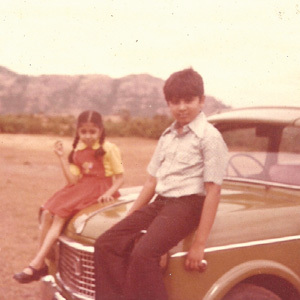 Flashback: The author (left) with her brother, on their family’s Fiat, from one of her road trips in India. I reminisced about family road trips from my childhood, taken with my parents in our cramped Fiat, when my mother packed up nearly half the household in the car ‘just in case’ and my father focused on the driving and the destination, never the journey. And at the end of most trips was always someone’s home. Many international students like me learned to search for and navigate the everyday Americana and its American definition of ‘home.’ In the back of our minds, we were constantly comparing it with memories of our own ‘back-home’ homes, redrawing the maps, overlaying it with our culturally unique vocabularies, trying to remember new places in the context of the old and familiar ones. If we were lucky, we knew someone who invited us to their home to visit. We took these invitations seriously; these meant that the road trip would include a safety net—a second version of a ‘home’ known through associations. A year had passed before I lifted my head from two rigorous semesters—it was late spring in Illinois. The snows had finally melted and left trails of salt stains in the streets. We cleared our desks at the University. The air smelt crisp and light, our bodies lighter, as we shed the many layers that separated us from the season—the warmth of spring covered the leafless trees with flowers. Everything rejoiced at the warmth, and I could finally breathe again. I allowed myself to explore past the now familiar bus routes of campus, beyond the map of the town, each time feeling braver to take the long bus route back to the apartment—the one that went out to the edge of town. Meaningful friendships seemed possible in the spring. Schedules, deadlines, or even peer pressure did not limit my movements or interactions. Over a cup of hot chocolate one May evening, I bonded with someone much like me—Uma—neither of us were quite certain what America really was, and if we liked it enough. We decided to purchase a beat-up car together. We were trying to be independent because we were told we should be, we had lived in America long enough. The little, beat-up, rusty, silver 1984 Toyota Tercel opened roads for Uma and me. We often drove an extra mile or two to explore, until a feeling of uncertainty would overcome us, and we would retrace our route back to our respective tiny rented rooms. We would replace the smells of the open road, the pollen-laden but fragrant Midwestern spring air, with the aroma of all things old and familiar—the assortment of spices and tempting fragrance of last night’s dinner. Spring turned to summer. We had spent several weeks driving around, now feeling braver than before. Uma and I decided to drive to Rock Island, Illinois, to visit a good friend of his, Larry. I had met Larry once before. This was my first road trip with Uma. As we left the little campus town, the landscape around us changed. There were fewer and fewer homes, until very quickly we were surrounded by cornfields. The August sun was shining high, and the single tone of emerald green covered miles and miles of the Midwestern prairie land with tall and endless stalks of corn flanking either side of the highway as far as the eye could see. From that distance, those neat rows of green exposed the curves of the slowly undulating hills beneath, like blankets that covered everything until it reached the horizon, waiting for the earth to move so we could sense its presence. We watched them roll on for miles behind us. In the absence of our professors, the AAA maps and guidebooks became lifesavers. I guided Uma from the passenger seat, unfolding a large map with colored lines, squinting through numbers and street names as Uma drove. We tried to understand highway interchanges, and their relationship to fast food places, gas stations, and truck stops. Some things that Professor Riley taught us made sense, some did not. I slowly read and educated both of us on the places we were passing, hoping to find scenic routes that were not far away from the highway. I looked for that bend in the road, that tree that changed a route, or that person who would enthusiastically wave his arms in the air with the earnest intention of guiding us to our destination. But there was none of that. We had stayed on the main highways, because we were brown students in corn-country, in a rented car whose license plate read Oklahoma, a state neither one of us had visited. Uma had a healthy Einsteinesque mustache and spoke with a heavy South Indian accent. We both had full manes of thick dark hair and were awkward young foreign adults. We stuck out like sore thumbs in the rolling countryside. We constantly kept ourselves in check, thanks to the fear of upsetting our coveted and rather vulnerable international student status. We skipped through fading radio stations, sticking to what I recognized, perhaps something I could sing along to—Uma was not much of a singer. And in between trying to find a radio station, we found time for conversation. There were very few distractions. The landscape faded into a flat picture, like traveling through a painting—no references, no connections, just a vast land with its own history and people—but nothing that connected to us except our own shared desire to travel, at a pace we were comfortable in. The first time that hunger struck us on this trip, we were in a bind. Fast food places were not appetizing and sit-down restaurants were expensive for our student pocketbooks. We knew that we could find a Cracker Barrel for meal of mashed potatoes, made palatable with a generous dose of salt and pepper, and a serving of pie with ice-cream on the side for dessert. We each paid for our own meals. It would suffice until we found ‘proper’ food again or reached Larry’s home. Uma had just learned to drive on the American highways and our three-hour trip took nearly five hours. It was all right, we were not in a rush. When we reached Larry’s home, we had stopped to eat at another Cracker Barrel—this time we ate a little more than mashed potatoes and pie. I cannot remember much else except being exhausted enough that I curled up and fell asleep in Larry’s sister’s twin bed. Uma slept on the couch after their late-night conversation. I woke up to Larry setting a pot of coffee. They had both waited for me to wake up for breakfast. As Larry was cheerily singing ‘Good Morning, Princess’ to me, the smell of warm pancakes and sticky sweet syrup took over their house. I did not care if the pancakes came out of a box. His voice engulfed me in a big-brotherly kindness, something I had missed in my time in America. That weekend, we ate a lot of mashed potatoes and pie. That was 1996—I was 26 with a matching waistline. We headed back on the road to our campus lives. En route there has been courtship, marriage, and more, surrounding the genial search for home in distant landscapes. The author is seen here with Uma (Umashankar) at Shedd Aquarium, Chicago (1996). From two people who started their friendship, and subsequent courtship, over an old rundown car purchased for $300 and the love of a road trip, we’ve driven around plenty, and our desire to drive has not diminished. We are now a family of three. We’ve driven through many cornfields of Illinois, the bluffs of Missouri, a Nebraska ice storm, under midnight skies lit by the Aurora Borealis, through the back country of Pennsylvania, the cherry farms of Michigan, watching a full moon rise over the desert of Nevada, and admiring the massive wide-open spaces of New Mexico. We have driven through fog-covered winding roads of the Smoky Mountains. We have chosen to drive during our two cross-country moves, during vacations, and for work trips. We feel a little braver now to take the back-country roads. Yet, in all the miles we’ve driven and the towns we’ve visited, nothing compares to that nondescript road trip through the cornfields of Illinois, a drive that let me focus on both the journey and the destination, the value of the quiet moments and of the conversations. I learned that it was not about a glossy destination, but about how I felt when I got there. I learned that I did not mind a plate of mashed potatoes, or a slice of diner pie, if it meant I was going someplace warm and welcoming at the end of the day. Perhaps they would wait for us, perhaps someone would make us pancakes, coffee or tea in the morning, and make us feel welcome in their home. Yes, that one seemingly monotonous drive through the cornfields of Illinois taught me that the only place I wanted to be was home. Nandita Godbole is an Atlanta-based, Indian-origin food writer and cookbook author, whose latest title is Not For You: Family Narratives of Denial & Comfort Foods.